Certain local, state and federal agencies have now established policies indicating that if a tool needs to be used to remove a part of the weapon to install a new accessory it cannot be done unless the weapon is sent to the agency's armorer or gunsmith for the installation. This has caused a problem for some agencies due to time constraints and the absence of local agency armorers. 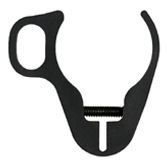 GG&G has developed the New Agency Rear Sling Adapter to assist these agencies with this issue. The new GG&G Agency Rear Sling Adapter only requires that the rear assembly of the collapsible buttstock be removed. No tools required. The new adapter then slides over the tube and, once in proper position, securely tightens behind the castle lock nut. The system uses two socket head screws for fastening, so that once tightened there is no chance the sling adapter will come loose. The Agency Rear Sling Adapter is manufactured for professional use from 7075 aluminum and hard anodized to meet Mil-Specs. A 9/64" wrench is included for your convenience. Note: GG&G items will not be accepted for return if their original packaging has been opened. Please feel free to call or email us if you have any questions as to whether or not a particular GG&G item will be appropriate for your weapon or sling mounting needs.